Posted on Monday, October 11th, 2010 at 20:43. The hardest thing about blogging is keeping your blog up to date! I must say I wasn’t a good blogger the last months. But, guess what, I have some good reasons! First of all I had a really nice vacation, travelling all around the USA for 4 weeks. I’ve visited some big cities (Seattle, Salt Lake City, Las Vegas, San Francisco,…) and national parks (Yellowstone, Canyonlands, Death Valley, Yosemite,…). After my vacation I almost immediately started looking for a new job. Because I wanted to increase my technical knowledge about the latest Microsoft technology, I decided to look for a job in consultancy. Among 6 other companies who liked to offer me a new position, I chose Euricom. 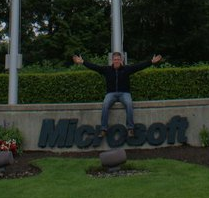 Euricom is located in Mechelen and only hires senior Microsoft consultants. I will not only be able to work with some of the best .NET professionals in Belgium, also a high-tech programming environment lies in front of me. I’m really looking forward to this new challenge, which will start at the end of November. As an advanced .NET developer you will probably find me participating in top .NET projects in Belgium.